Emotional intelligence refers to comprehending the feelings of oneself and others, utilizing these feelings to cope with daily-life demands, showing empathy, adaptability to change, managing stress, self-motivation and establishing successful relationships. Many authors state that there is a social deficit in children and adolescents with attention deficit hyperactivity disorder (ADHD). Children and adults with ADHD were found to have lower ability in recognizing emotions from mimics and sounds, have more aggressive behavior, lower frustration tolerance and impaired self-control. Therefore, some authors suggest the addition of a new core symptom in the diagnosis of ADHD, which could clearly identify problems at the interpersonal interaction besides attention deficit, hyperactivity, and impulsivity. Considering the fact that abilities associated with emotional intelligence can be learned and improved, developing emotional intelligence can be thought as a target for therapy by individualized education for patients with ADHD. Duygusal zeka, kendisinin ve diğerlerinin duygularını anlayabilme, problem çözerken bu duygulardan faydalanabilme, empati yapabilme, değişikliğe uyum gösterme, stresi yönetebilme, motive olabilme ve başkaları ile başarılı ilişkiler yürütebilmeyi tanımlar. Birçok yazar dikkat eksikliği hiperaktivite bozuklu-ğu (DEHB) olan çocuk ve ergenlerde sosyal defisit olduğunu belirtmiştir. DEHB’li çocuk ve erişkinlerin mimiklerden ve seslerden duyguları tanımada daha kötü performans sergiledikleri, daha fazla agresif davranış gösterdikleri, daha düşük engellenme toleransına sahip oldukları ve özdenetimlerinin bozul-duğu bilinmektedir. Bu nedenle bazı yazarlar, dikkat eksikliği, hiperaktivite ve dürtüsellik yanında kişiler arası etkileşimdeki problemleri açıkça tanımlayabilecek emosyonel işlev bozukluğunun DEHB'nin çekirdek belirtisi olarak kabul edilmesi gerektiğini ileri sürmüşlerdir. Duygusal zekâ ile ilişkili yeteneklerin öğrenilip geliştirilebileceği göz önüne alındığında, duygusal zekânın geliştirilmesi için bireyselleşti-rilmiş eğitimin DEHB'li hastalar için bir tedavi hedefi olduğu düşünülebilir. Barkley RA (1997) Behavioral inhibition, sustained attention and executive functions: constructing and unifying theory of ADHD. Psychol Bull, 121:65–94. Barkley RA (2014) Attention-deficit Hyperactivity Disorder: A Handbook for Diagnosis and Treatment, 3rd edition. New York, NY, Guilford Press. Bar-On RE, Parker JD (2000) The Handbook of Emotional Intelligence: The Theory and Practice of Development, Evaluation, Education, and Application--at Home, School, and in the Workplace. San Fransisco, CA, Jossey-Bass. Biederman J, Faraone S, Milberger S, Guite J, Mick E, Chen L et al. (1996) A prospective 4-year followup study of attention-deficit hyperactivity and related disorders. Arch Gen Psychiatry, 53:437–446. Bisch J, Kreifelts B, Bretscher J, Wildgruber D, Fallgatter A, Ethofer T (2016) Emotion perception in adult attention-deficit hyperactivity disorder. J Neural Transm, 123:961-970. Brackett MA, Rivers SE, Salovey P (2011) Emotional intelligence: Implications for personal, social, academic, and workplace success. Soc Personal Psychol Compass, 5:88-103. Brown TE (2011) Dikkat Eksikliği Bozukluğu: Çocuklarda ve Yetişkinlerde Odaklanamayan Zihin, 3.Baskı (çeviren: Sönmez EÇ) Ankara, ODTÜ Yayıncılık. Cadesky EB, Mota VL, Schachar RJ (2000) Beyond words: how do children with ADHD and/or conduct problems process nonverbal information about affect? J Am Acad Child Adolesc Psychiatry, 39:1160–1167. Ciarrochi J, Chan AY, Bajgar J (2001) Measuring emotional intelligence in adolescents. Pers Individ Diff, 31:1105-1119. Climie EA, Mastoras SM (2015) ADHD in schools: Adopting a strengths-based perspective. Can Psychol, 56:295-300. Climie EA, Saklofske DH, Mastoras SM, Schwean VL (2017) Trait and ability emotional intelligence in children with ADHD. J Atten Disord, doi: 10.1177/1087054717702216. Emond V, Joyal C, Poissant H (2009) Structural and functional neuroanatomy of attention-deficit hyperactivity disorder (ADHD). L'encéphale, 35(2):107-114. Fleming C, Snell Jr WE (2008) Emotional intelligence in adults with ADHD. Psi Chi J Undergrad Res, 13(2):86-95. Greene RW, Biederman J, Faraone SV, Monuteaux MC, Mick E, DuPre EP et al. (2001) Social impairment in girls with ADHD: patterns, gender comparisons, and correlates. J Am Acad Child Adolesc Psychiatry, 40:704–710. Hecthman L (2005) Attention deficit hyperactivity disorder. 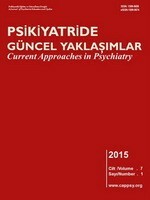 In Comprehensive Textbook of Psychiatry, 8th edition (Eds BJ Saddock, VA Saddock):2679-2692. Philadelphia, Lippincott Williams & Wilkins. Hertel J, Schütz A, Lammers CH (2009) Emotional intelligence and mental disorder. J Clin Psychol, 65:942-954. İşmen E (2001) Duygusal zeka ve problem çözme. M.Ü. Atatürk Eğitim Fakültesi Eğitim Bilimleri Dergisi, 13:111-124. Kauhanen J, Julkunen J, Salonen JT (1992) Coping with inner feelings and stress: heavy alcohol use in the context of alexithymia. Behav Med,18:121-126. Kim BN, Lee JS, Cho SC, Lee DS. (2001) Methylphenidate increased regional cerebral blood flow in subjects with attention deficit/hyperactivity disorder. Yonsei Med J, 42:19-29. Kinsbourne M, Bemporad B (1984) Lateralization of emotion: a model and the evidence. In The psychobiology of affective development (Eds NA Fox, RJ Davidson):259-291. Hillsdale, NJ, Erbaum. Kristensen HA, Parker JD, Taylor RN, Keefer KV, Kloosterman PH, Summerfeldt LJ (2014) The relationship between trait emotional intelligence and ADHD symptoms in adolescents and young adults. Pers Individ Dif, 65:36-41. Landau S, Milich R (1988) Social communication patterns of attention-deficit-disorder boys. J Abnorm Child Psychol, 16:69–81. Lizeretti NP, Extremera N, Rodríguez A (2012) Perceived emotional intelligence and clinical symptoms in mental disorders. Psychiatr Q, 83:407-418. Lomas J, Stough C, Hansen K, Downey LA (2012) Brief report: Emotional intelligence, victimisation and bullying in adolescents. J Adolesc, 35:207-211. Maedgen JW, Carlson CL (2000) Social functioning and emotional regulation in the attention deficit hyperactivity disorder subtypes. J Clin Child Psychol, 29:30–42. Mayer JD, Perkins DM, Caruso DR, Salovey P (2001) Emotional intelligence and giftedness. Roeper Rev, 23:131-137. Mayer JD, Roberts RD, Barsade SG (2008) Human abilities: emotional intelligence. Annu Rev Psychol, 59:507-536. Mayer JD, Salovey P (1995) Emotional intelligence and the construction and regulation of feelings. Appl Prev Psychol, 4:197-208. Melnick SM, Hinshaw SP (2000) Emotion regulation and parenting in AD/HD and comparison boys: Linkages with social behaviors and peer preference. J Abnorm Child Psychol, 28:73–86. Mennin D, Farach F (2007) Emotion and evolving treatments for adult psychopathology. Clin Psychol (New York), 14:329-352. Mikolajczak M, Petrides KV, Hurry J (2009) Adolescents choosing self‐harm as an emotion regulation strategy: The protective role of trait emotional intelligence. Br J Clin Psychol, 48:181-193. Nigg JT (2000) On inhibition/disinhibition in developmental psychopathology: Views from cognitive and personality psychology and a working inhibition taxonomy. Psychol Bull, 126:220–246. Pelc K, Kornreich C, Foisy ML, Dan B (2006) Recognition of emotional facial expressions in attentiondeficit hyperactivity disorder. Pediatr Neurol, 35:93–97. Petrides KV, Frederickson N, Furnham A (2004) The role of trait emotional intelligence in academic performance and deviant behavior at school. Pers Individ Diff, 36:277-293. Polanczyk G, De Lima MS, Horta BL, Biederman J, Rohde LA (2007) The worldwide prevalence of ADHD: A systematic review and meta regression analysis. Am J Psychiatry, 164:942-948. Quintero J, Vera R, Morales I, Zuluaga P, Fernández A (2017) Emotional intelligence as an evolutive factor on adult with ADHD. J Atten Disord, doi: 10.1177/1087054716688251. Reimherr FW, Marchant BK, Strong RE, Hedges DW, Adler L, Spencer TJ et al. (2005) Emotional dysregulation in adult ADHD and response to atomoxetine. Biol Psychiatry, 58:125-131. Reimherr FW, Williams ED, Strong RE, Mestas R, Soni P, Marchant BK (2007) A double-blind, placebo-controlled, crossover study of osmotic release oral system methylphenidate in adults with ADHD with assessment of oppositional and emotional dimensions of the disorder. J Clin Psychiatry, 68:93-101. Schlipf S, Batra A, Walter G, Zeep C, Wildgruber D, Fallgatter A, Ethofer T (2013) Judgment of emotional information expressed by prosody and semantics in patients with unipolar depression. Front Psychol, 4:461. Serrano VJ, Owens JS, Hallowell B (2015) Where children with ADHD direct visual attention during emotion knowledge tasks: relationships to accuracy, response time, and ADHD symptoms. J Atten Disord, 22:752-763. Shaw P, Stringaris A, Nigg J, Leibenluft E (2014) Emotion dysregulation in attention deficit hyperactivity disorder. Am J Psychiatry, 171:276-293. Sobanski E, Bruggemann D, Alm B, Kern S, Deschner M, Schubert T et al. (2007) Psychiatric comorbidity and functional impairment in a clinically referred sample of adults with attention-deficit/hyperactivity disorder (ADHD). Eur Arch Psychiatry Clin Neurosci, 257:371-377. Stein MA, Sandoval R, Szumowski E, Roizen N, Reinecke MA, Blondis TA, Klein Z (1995) Psychometric characteristics of the Wender Utah Rating Scale (WURS): reliability and factor structure for men and women. Psychopharmacol Bull, 31:425-433. Thapar A, Cooper M, Eyre O, Langley K (2016) Practitioner Review: What have we learnt about the causes of ADHD? J Child Psychol Psychiatry, 54:3–16. Trinidad DR, Johnson CA (2002) The association between emotional intelligence and early adolescent tobacco and alcohol use. Pers Individ Diff, 32:95-105. Uekermann J, Kraemer M, Abdel-Hamid M, Schimmelmann BG, Hebebrand J, Daum I et al. (2010) Social cognition in attention-deficit hyperactivity disorder (ADHD) Neurosci Biobehav Rev, 34:734-743.
von Morgenstern SB, Becker I, Sinzig J (2014) Improvement of facial affect recognition in children and adolescents with attention-deficit/hyperactivity disorder under methylphenidate. Acta Neuropsychiatr, 26:202-208. Walcott CM, Landau S (2004) The relation between disinhibition and emotion regulation in boys with attention deficit hyperactivity disorder. J Clin Child Adolesc Psychol, 33:772–782. Wender PH, Wolf LE, Wasserstein J (2001) Adults with ADHD. An overview. Ann N Y Acad Sci, 931:1-16. Whittle S, Allen NB, Lubman DI, Yucel M (2006) The neurobiological basis of emperament: Towards a better understanding of psychopathology. Neurosci Biobehav Rev, 30:511–525. Williams LM, Hermens DF, Palmer D, Kohn M, Clarke S, Keage H et al. (2008) Misinterpreting emotional expressions in attention-deficit/hyperactivity disorder: evidence for a neural marker and stimulant effects. Biol Psychiatry, 63:917-926. Yuill N, Lyon J (2007) Selective difficulty in recognising facial expressions of emotion in boys with ADHD: general performance impairments or specific problems in social cognition? Eur Child Adolesc Psychiatry, 16:398–404.